[T]he Fed may well have mitigated our current crisis by sowing the seeds for the next one… Our banks have gotten into the habit of needing to be rescued through repeated bailouts. During this crisis, Bernanke–while saving the financial system in the short term–has done nothing to break this long-term pattern; worse, he exacerbated it. As a result, unless real reform happens soon, we face the prospect of another bubble-bust-bailout cycle that will be even more dangerous than the one we’ve just been through. Since the 1970s, successive financial crises have required ever more dramatic reactions from the Fed. Every time there is a potential financial meltdown, the Federal Open Market Committee quickly cuts short-term interest rates. These cuts have become larger and larger over time, now essentially taking interest rates to zero. Each round of interest-rate cuts has made sense when a given crisis breaks. But these cuts–which effectively function as bailouts for banks that have gotten into trouble–often helped bring about the next financial crisis. And the crises are getting larger, not smaller, over time. Their solution to ending this cycle is to sharply raise capital requirements at banks, make managers and boards of directors at financial institutions personally liable to some extent for their companies, regulate the revolving door between industry and government for financial regulators, and make the Fed more accountable for systemic financial risk. While their solution list has merit, let me suggest a simple two-step reform package that I believe would end bubble-bust-cycle: (1) initiate a nominal income targeting rule for monetary policy and (2) adopt macroprudential policies. A nominal income targeting rule would helpful for several reasons. First, it would allow the Fed to see beyond the false comfort of maintaining low inflation. The Fed in 2003-2005 allowed short-term interest rates to remain inordinately low and economic imbalances to grow because, among other things, inflation was reigned in. 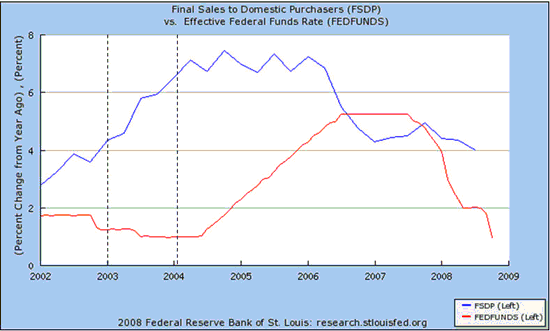 Had the Fed been looking at nominal income or spending growth, however, during this time it would been more concerned. (A key problem with an inflation focus for monetary policy is that it only works well with demand shocks. Nominal income targeting , on the other hand, handles both demand and supply shocks. See here for more.) Second, a nominal income targeting rule if strictly followed would help the Fed move away from making bailouts. By stabilizing nominal spending or nominal income, the Fed would minimize the booms, the bust, and thus the need for bailouts. While I believe a nominal income targeting rule would take us a long way in improving both macroeconomic and financial stability, it may not be enough given the political realities outlined above. Consequently, macroprudential regulations such as a counter-cyclical element to capital requirements would provide a nice complement. Together, these two polices should bring us closer to ending the financial bubble-bust-bailout cycle. Fed Watch: Patting Themselves on the Back?